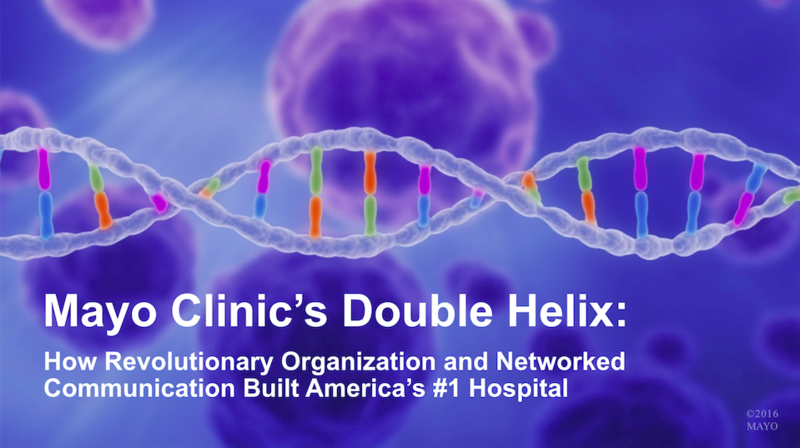 Communication via the massive reader, listener, and viewer networks provided through mass media has been second only to Word of Mouth in establishing and enhancing Mayo Clinic's reputation among patients and potential patients. And of course, Mass Media stories have also fueled Word of Mouth, as consumers discuss stories they've read, heard, or viewed with their family and friends. a country doctor from Minnesota (who) was able to match the figures of Hans Kehr, the greatest European authority on gallbladder surgery. Then briefly but dramatically he recounted the story of that country doctor and his brother, and of St. Mary's Hospital, which handled more surgical cases annually than any other hospital in the United States, more even than the great Johns Hopkins. When Dr. Will was elected president of the American Medical Association shortly thereafter, both his relative youth and being from a western town of a few thousand population caught the interest of other journalists. The Boston Transcript supplemented Adams' story with highlights of stories written by members of The Surgeons Club for a feature story that was widely reprinted. How would you feel if you were a millionaire, one of the richest men in the world...and with this great wealth you had a disease that baffled the physicians of this country; if in despair you had sought relief from the surgeons and physicians of France and England...only to be told, after a thorough investigation, that your only chance of living for even a few months was to return to your own country and travel out into the West to the little town of Rochester, Minnesota. You would be surprised, wouldn't you?.... Well, this was the recent experience of one of America's financial masters, and it has been the fortune of a number of other famous men who have sought abroad in vain for cures for their ills, and returned to find the remedy here. Features like these, even though they were published without cooperation from the Mayo brothers, caused resentment among some of their professional peers. Without active media cultivation, over the next 90 years, Mayo Clinic continued to appear in mass media stories, often as a result of famous people coming to Rochester for diagnosis and treatment. Many celebrities chose Mayo Clinic both for excellent care and because it was removed from the media scrutiny of larger metropolitan areas, but others — from Lou Gehrig to Muhammad Ali to President Ronald Reagan to Jordan's King Hussein — were more public about their Mayo Clinic experiences. In the late 1990s Mayo Clinic developed a national media relations strategy to pursue so-called "earned media," focusing mainly on promotion of Mayo research findings published in peer-reviewed scientific journals. This led to hiring more externally-focused communications professionals (including me in April 2000) to cover internal beats, write news releases, pitch journalists, and produce syndicated news content. Mayo Clinic's venturing into social media was an outgrowth of that national media relations strategy, as we saw the evolution of social and digital tools made it possible to combine with the broad reach of media and the power of personal recommendations, essentially combining the two most important factors behind preference for Mayo Clinic. Through the remaining posts in this series, I will recount the origins, growth and development of social media at Mayo Clinic, and their consistency with Mayo's values and cultural DNA. Lee Aase is a Communications Director for Mayo Clinic's Social & Digital Innovation team and is Director of the Mayo Clinic Social Media Network. 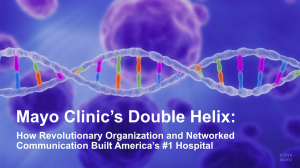 This post is part of a series called Mayo Clinic's Double Helix: How Revolutionary Organization and Networked Communication Built America's #1 Hospital. This is a great article. Thank you for sharing. 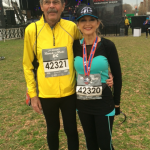 Lee can we help Mayo Clinic lung cancer research by sharing the 2018 Team Draft Super Bowl Lung Cancer (Mayo Clinic patient story) Winning Survivor story in more ways? All to benefit Mayo Clinic brilliant and committed Thorasic, Chest, Pulmonary & Research Physicians ?